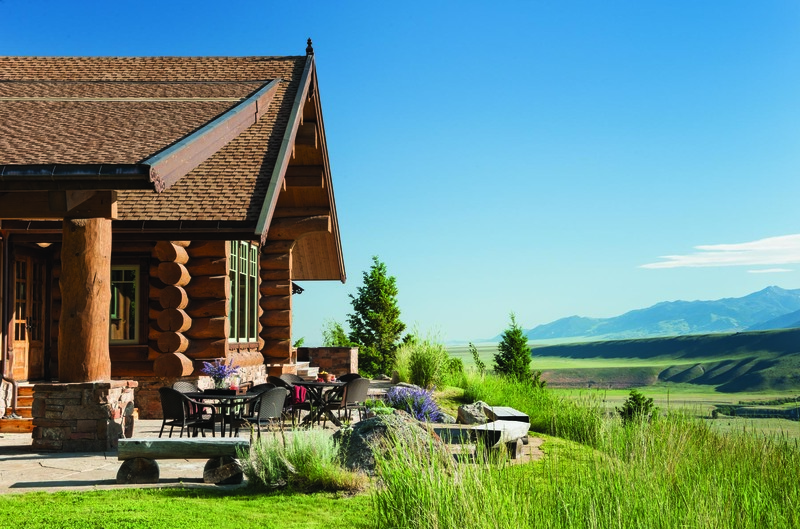 Nestled on a hillside overlooking a wide expanse of the Madison River and mountain range, Distant Thunder Lodge testifies to the invariable beauty that comes from a cross-cultural design merger. The Norwegian homeowner wanted a Montana residence that reflected his heritage and honored the Mountain West aesthetic. The perfect structure to do both was a log home. 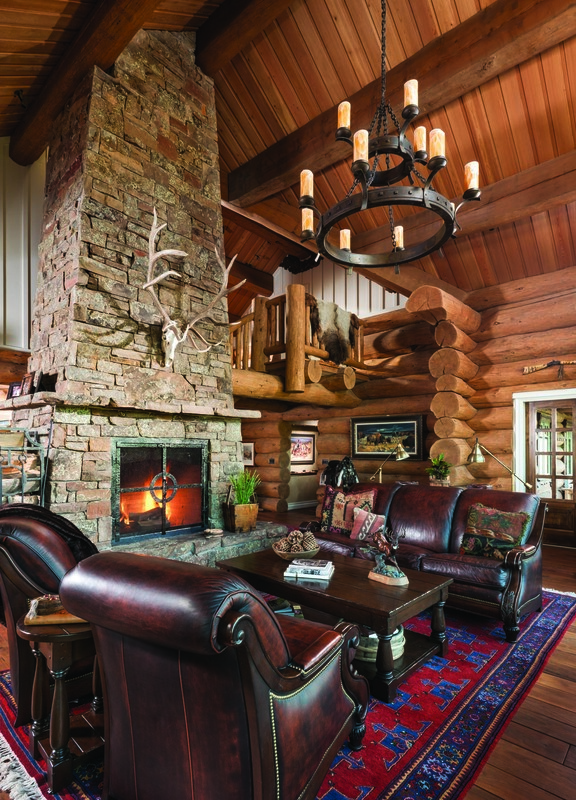 “What the homeowner wanted to do, was mix the North American log work with the old, old Norwegian details that he loves so much,” explained Blair Anderson, founder of Hilgard Log Builders, in West Yellowstone, Mont. 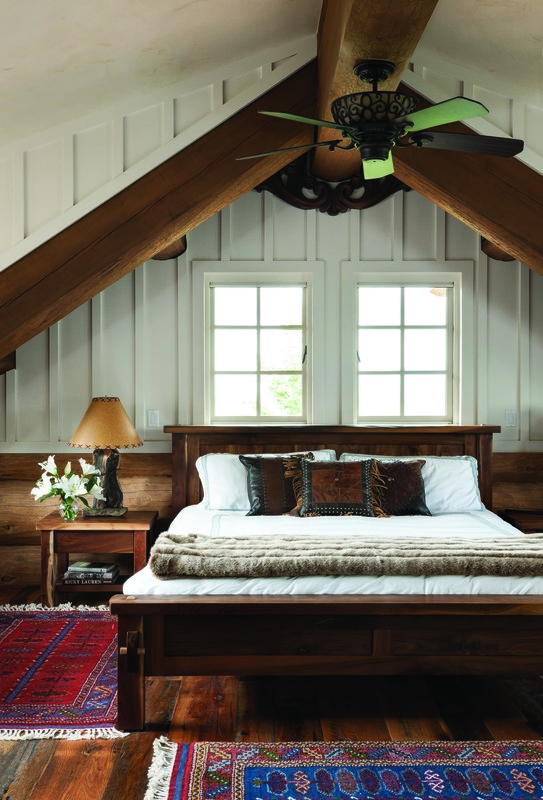 Each room in the home is distinct, a feeling created by unique ceiling attributes such as exposed timber, gables, soffits or paneling. 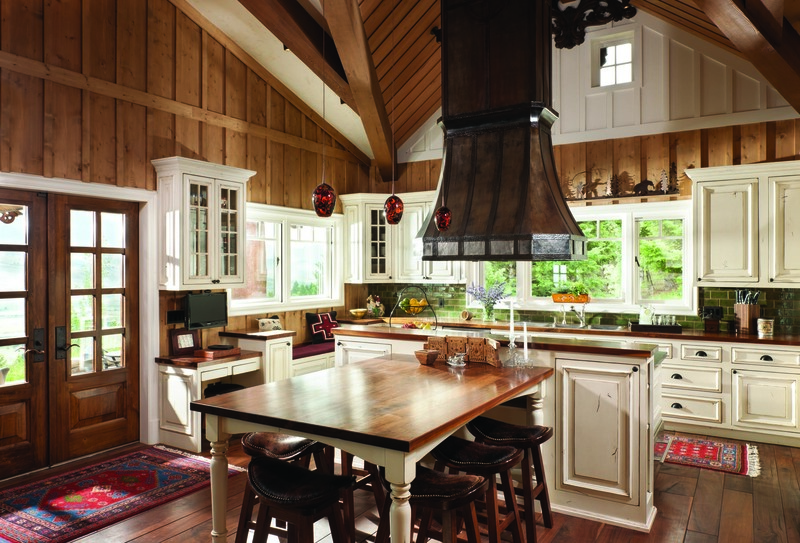 For example, mortise-and-tenon timber framing in the kitchen pitches to join the great room ceiling, which grows in significant volume, creating two distinct spaces despite the open floor plan. In addition, paneling in a traditional Norwegian herringbone pattern sets the dining room apart stylistically. A staircase tucked behind an exposed, Montana moss rock chimney (which tapers slightly), leads from the public spaces to the more private bedrooms. Extensive craftsmanship results in a home with sculptural detail that maintains its intended purpose of livability. Norwegian carvings that were brought over in shipping containers through the Panama Canal to Washington and then trucked over to Montana, adorn both the exterior and interior of the home. They were created by a family that’s carved traditional Norwegian designs from single pieces of pine for hundreds of years, explained the homeowner. There are two styles of carvings found in the house: a St. George variety, which incorporates dragons and was inspired by the doors of a church built in Norway around the 1200s, and an Acanthus or floral variety. In addition, copper gutters and handcrafted furnishings were also imported from Norway. 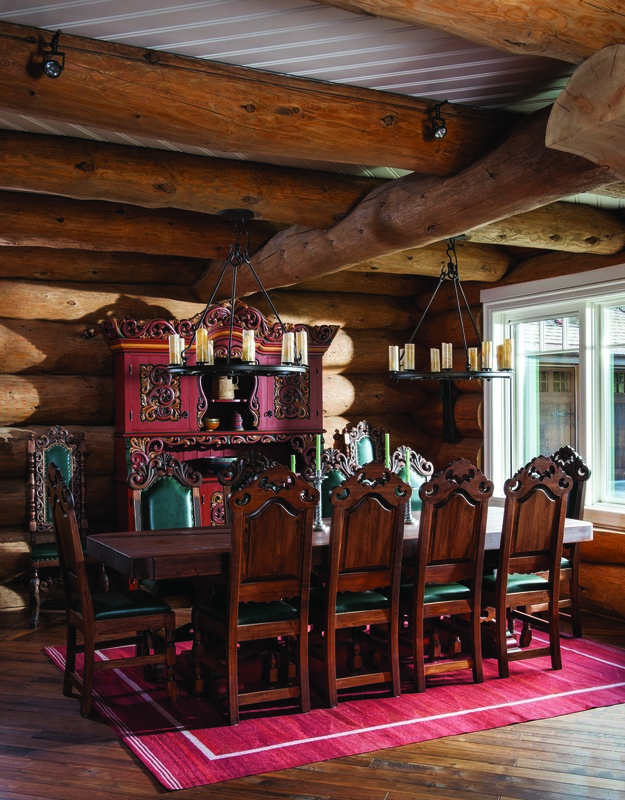 The white paint brightens the space and ensures that the log home avoids a dark or cave-like feeling. There are also about 15 species of wood in the home: from logs harvested in the Bridger Mountains, to butternut doors, to an antique reclaimed walnut used in the downstairs floor. “It showed [Schultz’s] brilliance, without question. 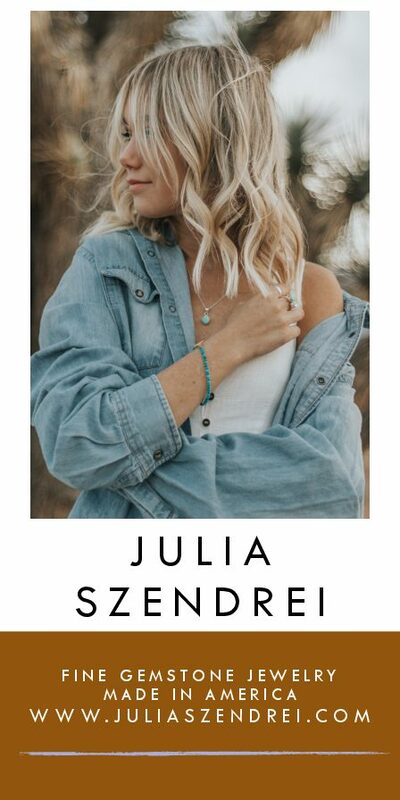 The color choices and the palette that she presented were just marvelous. I’m sure it was a challenge for her but she made it look easy,” Anderson said. 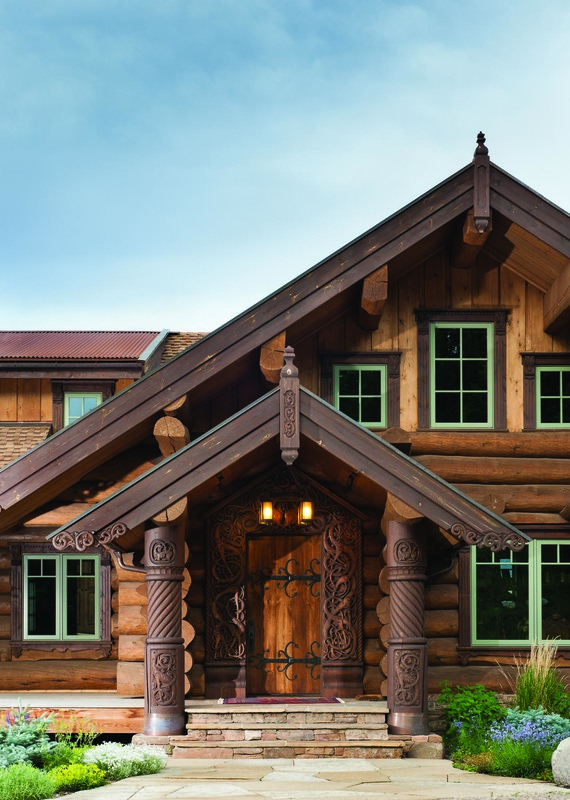 The personal touch of craftsmanship and a blend of traditional Western design with the textures and details of the homeowner’s heritage, makes for a Little Norway in the Rocky Mountains. Mortise-and-tenon timber framing in the gable-roofed kitchen creates an appearance of a later addition to the stacked logs in the main house. The log walls are Douglas fir mostly harvested from private property in the Bridger Mountains for fire mitigation. 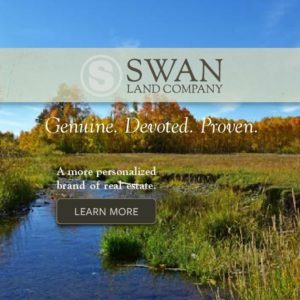 “I’ve been doing this for so long — selectively cutting logs — that … now I’m starting to see the younger trees coming of age to be house logs,” Blair Anderson said. 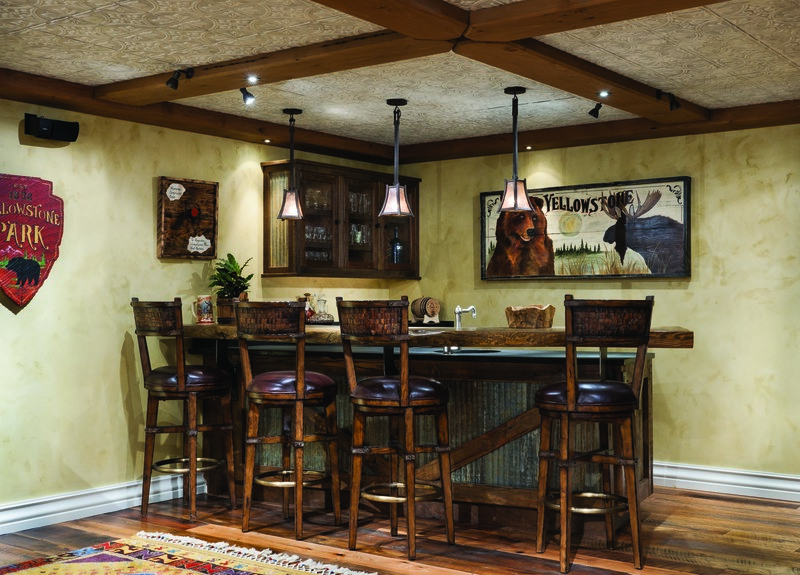 In the dinning room, lowered ceilings provide a sense of warmth. The white framed windows hone in on the outdoor views. 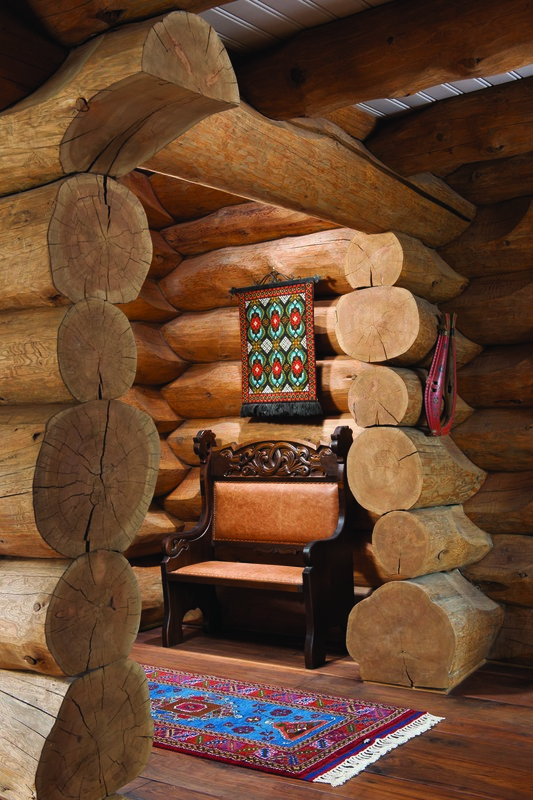 The furniture was hand-carved and imported from Norway. The home utilizes outdoor space with decks and patios, where the homeowners can entertain or find a quiet place to enjoy the vistas of the Madison Valley. The home observes Hilgard Peak, the tallest mountain in the Madison Range, and the elk, deer, wolves, moose and bear that move through the river valley corridor. The chimney in the great room tapers at a slight, but ascetically substantial, degree, providing an additional example of the craftsmanship and careful attention to detail found throughout the home. The home sleeps 18 comfortably when extended family or friends visit. 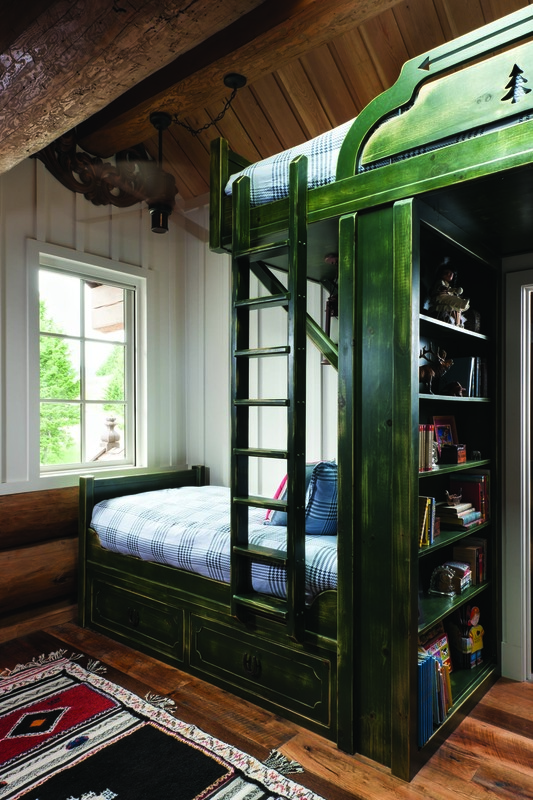 Modeled after Norwegian farm bunks painted in deep red, blue or green, and found throughout the home, bunk beds built by Big Timberworks include built-in cabinets and drawers for space-saving functionality. 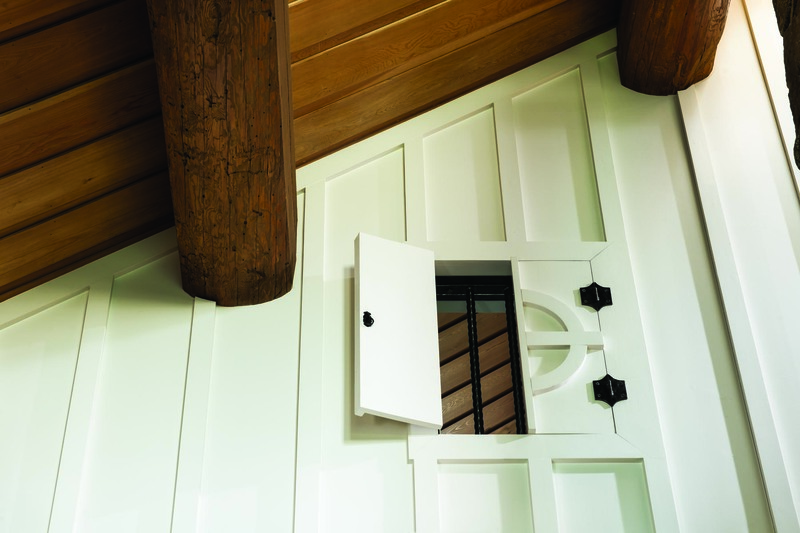 The children’s bunk room incorporates details such as railroad spikes and horseshoes for door and drawer handles, blending Norwegian design with the western vernacular. From the children’s bedroom, a built-in shutter peaks out over the great room. Continuity of design is carried throughout the home, including the private master bedroom with its vaulted ceiling. 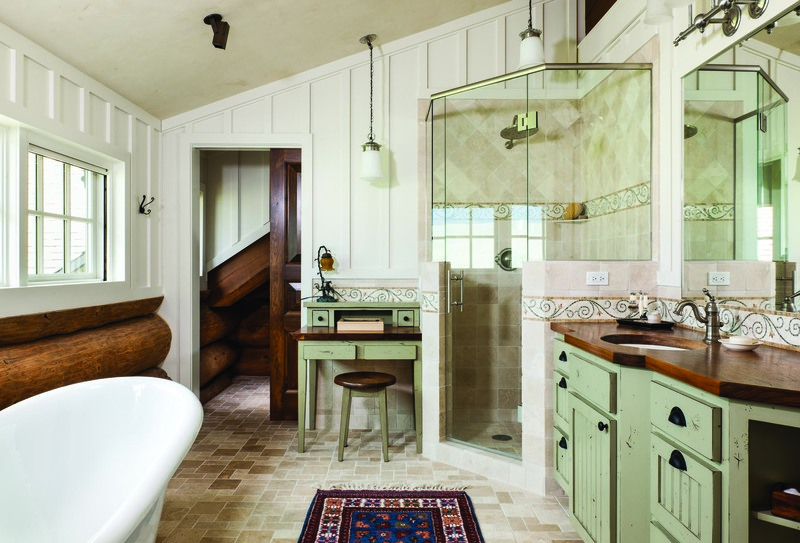 The master bathroom includes Norwegian paneling made from poplar for added texture and structure.